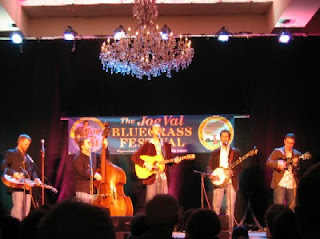 Yesterday I went to the Joe Val Bluegrass Festival in Framingham, MA for the first time. Every year I say to myself that I want to go, but never did because I’d probably have to go alone and that’s not as much fun as going with someone. Anyway, I decided to go check it out and I sure got my fill of bluegrass! There was a fair amount of boom-chuckin’ and Flatt-runs and chicken-pickin’ going on, I guar-en-tee. One of the things I liked best was the workshops. 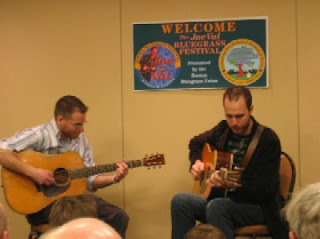 The photo to the right is one I went to with Josh Williams, IBMA (whenever they said that at the festival, I was, like, ” What’s IBM got to do with bluegrass?”) guitar player of the year. Getting to hear him play up close was worth it. He played Cherokee Shuffle first, by himself, which was screaming! (That means good.) Then he talked about some of his playing techniques and bad habits that we shouldn’t do. There were some questions from the audience – a good one got him to talk about how when he’s soloing he gets into a zone and really doesn’t know what he’s doing or how. I do think that is true when you are really playing “in the moment” and Josh can do it because he’s already got chops up the wazoo. Someone noticed that he didn’t use his pinky finger and this is true – he’s learned to do everything with just the 3 fingers on his left hand and it doesn’t seem to hurt. Tony Watt joined Josh at the end to do Nine Pound Hammer, with Josh singing and them trading choruses. I went to the band’s 2:10 show on the main stage which was quite good and entertaining. They are a new band and trying to establish themselves. I think doing these festival circuits is how they build an audience. I certainly wouldn’t have known about Josh Williams unless I had gone there and heard him play up close. I also went to the Tony Watt guitar workshop, where he was jamming with Avril Smith, from the DC band Tinsmith (who I just checked out and really like!). 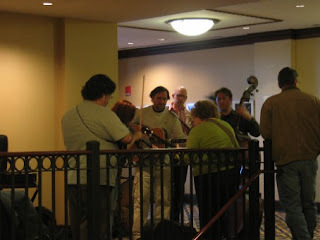 They talked about playing fiddle tunes and everyone seems to want to know how to hold a pick the best way. I think the best advice I heard was to just jump in and sink or swim, when it comes to jam sessions and improvising. Luckily I don’t have a problem winging it, but I guess some folks are uncomfortable straying from the melody. An interesting phenomenon about the festival, which is thankfully indoors, since it was about 30 degrees out, was that people were just jamming in the hallways all over the place. This is to take the place of the normal campground, outdoors in nice weather jam sessions that take place. You can definitely understand why having a big dreadnought guitar is a must in these situations, because the banjoes, mandolins, and fiddles dominate the sound. Even nice guitars like Martin or Collings get overwhelmed when it’s time to solo. Even the bass comes through loud and clear in these sessions. If you want to join in, you just show up and bring your voice or instrument. Most of the songs I had heard before, like Dark Hollow, or Red Haired Boy. In the vendor showcase room, I talked with Steve Beckwith of Beckwith Strings, who is building guitars out of his place in Bolton, MA. His guitars look really nice with cool wooden inlays. He said he used to work at Intel, but now does this for a living…well, he’s trying to make a living at it. I’m sure it is hard. His guitars were around $1000 – 1200, which seems like a good price to me for a hand-made instrument. We talked a little bit of shop about guitar building and neck joints, in particular. Maybe I’ll follow up with him and see if I can check out his shop as I put mine together. Finally, I went to the Dailey and Vincent band show. Their harmonies were amazing! 4 parts and you could tell that they knew they were on, because they just let ’em ring at the end of some of the songs and they did an acapella song. A bit too much god and jesus in these songs for me, but they were very good anyway. That’s my report for this year. Next year, it might be better to go on Saturday because some of the workshops available seemed better (and there were more of them). New Courses at Vermont Instruments! Posted by Chris Reckling on February 15, 2009 Comments Off on New Courses at Vermont Instruments! I just checked in on the Vermont Instruments website this morning and see that they are now offering additional courses this year. The first is a 2-week banjo making course with Will Fielding. The second is a one week guitar repair course, led by Adam Buchwald. I remember Adam talking about both of these ideas when I was there in Oct 2008. The guitar repair course is designed to be added on to the end of the guitar building class or to be used by itself. Both are very tempting for me! VT in May? mmmm…..